5 Totally Legit Reasons You Should Join Our Patreon Page! Patreon is described in Wikipedia as “a membership platform that provides business tools for creators to run a subscription content service, as well as ways for artists to build relationships and provide exclusive experiences to their subscribers, or “patrons.” We have our own Patreon, we are working really hard on it and we believe in it. We hope you will join us and here are 5 totally legit reasons why you should. First of all, Patreon itself is really cool. Let’s just talk about Patreon for a second if you aren’t familiar with it. It’s a great website as well as mobile app that is growing and adding features and opportunities constantly. You can find creators of all sorts to connect with there and subscribe to their page for anywhere from one dollar to $15 per month (and sometimes more for really big rewards) just for various levels of fun basic content. Artists, musicians, comedians, business gurus, podcasters, vloggers – you name it. And the creators who rely on this platform to make a living at what they do are generally really thankful for their communities who subscribe for their content. As an end user you can go on the desktop version and even better download the mobile app. The creators you subscribe to can upload video, audio, photos, livestreams, links, polls, stories, or just text right to the app. So you can listen, watch, comment, and interact with other fans & followers all from your smartphone. You can access all of these things on demand as you like – a great way to support the people you enjoy on the go. You’ll love it. Keep in mind that the best creators on Patreon typically have YouTube channels, blogs, Instagram and Snapchat, and a whole variety of profiles online where they’re sharing free content, but the ones who do it right are giving extra rewards and exclusive content to their patrons because the patrons are paying for it – they definitely appreciate your support. As for OUR Patreon page, we’ve already posted a TON of stuff there…and we’re adding more. We are having a blast with the podcast, and a shout out goes to the amazing Olivia Thai who supplied the little impromptu beatbox intro that you hear at the beginning of each one which we literally pulled from when she called into our morning show one day! Meanwhile, we have SO much else to offer, and so we’ve been pouring ourselves into creating content for Patreon much like the courses we have taught here at our studio such as Doug’s teachings in his “2 Hour Social Media Class” and Ally’s “Photography 101” class. People who follow us outside of the Metro Detroit area had been asking for a way to learn from us or get online courses and now Patreon gives us a way to do that with in-depth tutorials that we upload there. The feedback on these has been solid (more on that in a bit) and we’ll even take requests on topics that our Patrons want covered specifically. We do some of these with recordings of our computer screens while we’re walking you through how to create social media content or how to edit a photo in Photoshop. These are great because you can access them on demand, at your own pace and you can watch them repeatedly. 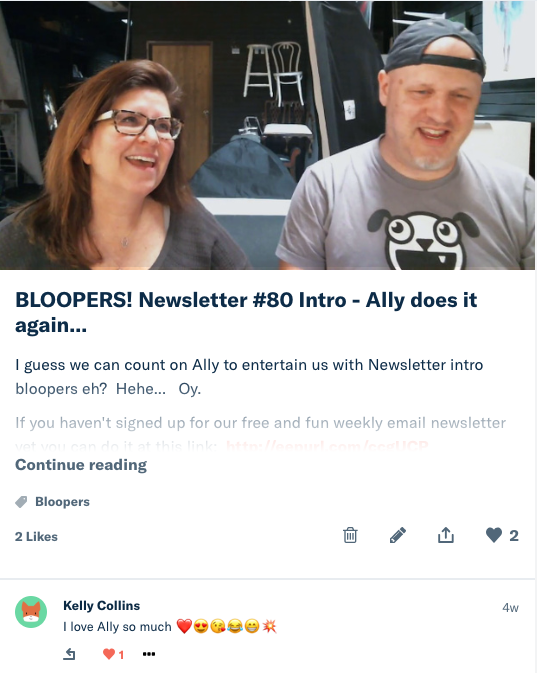 We’ve added a few other exclusive series there too such as “Entrepreneur Life” where we talk about the highs and lows, thrills and challenges of having your own business – things that we’ve learned and sometimes the hard way… We even include the occasional blooper! As of this first writing we are at over 40 pieces of content total, available at the various levels. You may find if you browse around Patreon overall that there are some who use their page simply as a donation mechanism – a way for their followers to contribute money to support what they are already doing elsewhere. Not calling anyone out specifically or saying that’s bad per se… But that’s not our strategy. If you’re paying for our Patreon, you’re getting your money’s worth ON Patreon. We’ll even send you a Doug&AllyMorning Show!☕ bookmark at the $5 level and up! Our Patrons Are Happy – they are validating what we are doing there – so take their word for it! We’ve always said we are all the Frameable Faces – sure it’s Doug & Ally – we own the business. But we’re part of the community just like everyone else, and it’s our peeps that make our studio and it will be our peeps that make the Patreon page too. Our friend Gareth from the UK is “Pliny The Round” and he’s already been posting in the “Community” tab on the Patreon which is awesome. The people do and will continue to shape the community there. We’ve had Patrons make suggestions for things to include in the Podcast and we frequently reach out for feedback. At this point we are toying with adding Discord to our page (an app much like Slack that gamers have traditionally used for group chat and voice to text around certain topics) which can be integrated with Patreon. Just another way to bring the community closer together – so we’ll see how Discord plays out. Regardless, with Patreon since people are subscribing everyone has a vested interest in making it great! We don’t really horde our secrets. We subscribe to the idea that sharing helps the community, it helps the industry whether that be social media or photography, and we never have just one main magic sauce really anyway. Once we’ve shared the sauce we’ve already concocted the next one. We’re always concocting a new sauce and improving the current sauce, and just because someone took our sauce and tried to make it doesn’t mean they’ll make it exactly how we made it. If by chance they made it better than us? Well than that will just give us something to shoot for won’t it? If you like the way we do things and you think you could learn from us, you will at our Patreon page. We promise. Thanks for reading and we hope to you see you there! We won’t let you down!